We are a consumer culture and often times try to ‘sell’ Jesus to our friends and family by wearing Jesus Saves t-shirts, bumper stickers, and hats. We put snippets on FB and our blog about Jesus and the Bible. We are missing out on the relationships with people, and showing them how we are ‘personally branded’ by Jesus. Tim Sinclair writes “Branding Jesus (and becoming branded by Him ourselves) will require rethinking the way evangelism has always been done. It will require challenging the status quo. It will require questioning the effectiveness of our current methods. It will require regaining our passion, reenergizing our base, and rebuilding our personal outreach strategies from the ground up”. Basically we can’t continue doing things the same ways we have been doing them for years. The culture is changing and the people are exploring options other than Jesus. Many think that they don’t need Jesus and that He has nothing to offer them. We as Christians don’t always “get a specific culture or worldview.” And to understand them better and effectively reach them we need to be prepared to speak to their ‘reality’. We can’t market something that people don’t want. We can’t push Jesus on those who don’t see a need for Him. We need to be changed and renewed ourselves, being honest in our relationship with Him, the good yes, but also that the life of a Christian isn’t about perfection, nor is it without pain. 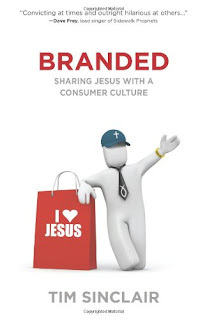 Branded was a good analogy of the practice of marketing in our culture and how we present Jesus in a similar fashion. Tim Sinclair’s theme of marketing worked well through the book, and put into easy language a theme we have heard often. Go out and meet people where they are at. Tim Sinclair brainstormed some ideas on a ‘white board’ in one chapter, and though some sounded interesting there were others I was like ‘what!’ toward. Take them with a grain of salt, take the ones you are comfortable with and see if you can impact our culture today by showing how you are branded with Jesus. Thanks for the review Melanie! I appreciate you taking the time to read the book, and I'm glad that you enjoyed it. Hope you have a wonderful weekend!